Last month, MAH curator Susan Hillhouse and I sat down and wrote an exhibition philosophy for our museum. We wanted to share with people, in as clear and transparent a format as possible, our approach to developing exhibitions. In particular, we want exhibition collaborators--artists, researchers, historians, collectors--to understand our goals and how we intend to steer the exhibition development process. It's a working document, and we mean to put it to work planning new projects with our partners. The Museum of Art & History is committed to creating exhibitions that inspire our diverse audiences to engage deeply with contemporary art and Santa Cruz County history. We see our visitors as partners in actively interpreting and exploring exhibition content. This philosophy steers our work, and it means that we do things a little differently than some other museums and galleries. If you are working with us as an artist or contributor to an exhibition, you should expect that museum staff will create multi-modal, interdisciplinary, participatory, immersive, and social experiences around your work. We will invite you to engage in discussion about these exhibition elements, and if you want to be involved in brainstorming possibilities, that’s fabulous. If not, that’s fine too–but you should know that we will be following this philosophy in all of the exhibitions that we develop. We wrote this exhibition philosophy after a series of confusing and sticky conversations with collaborators about mutual expectations of what an exhibition should be. We knew internally that we wanted our exhibitions to become more interdisciplinary, more participatory, and more responsive to audience needs. But we weren't explicitly making those goals public. Susan and I had many long conversations with contributors who were concerned that our efforts might demean or distract from their work. We discussed research about how visitors experience museums. We debated the relative merits of different forms of interactivity. We challenged our partners, they challenged us, and we all learned a lot from the experience. And by "learned a lot" I mean we learned we needed an exhibition philosophy--a starting point for dialogue that could happen earlier in the exhibition planning process. Debates about interpretative materials, interactivity, audience needs, and visitor participation are often seen as internal museum wonk issues. But at a small community museum that primarily creates exhibitions with living, local artists and collaborators, we have to involve our partners in this conversation. If an artist is uncomfortable with the idea of interactivity around his work, or a historian is unwilling to allow visitors to comment on her research, that's a problem for us. It goes against our goals for the visitor experience, and those goals are ultimately more important to us than showing any particular artwork or artifact. In most cases, there's a way to work through the disagreements to come up with a solution that satisfies everyone's needs. But we wanted to be direct with potential partners about what we're trying to do--and why. I think the hardest thing was that I never did and still don’t understand what people wanted, what they were expecting to get, and whether they got it or not. I think it was a little unclear what the mandate was. To a certain degree, I’m happy to do my own projects and it was amazing to work with you guys and I learned a lot, but any situation where you’re invited to do something and you don’t know if you’re fulfilling expectations is emotionally challenging. I'm curious about other ways that museums directly express their philosophy on exhibitions, or learning, or programming, as a guide for partners and visitors. I know a few institutions have internal documents on these kinds of things (ASTC just published several from science centers around the world), but I'm curious about the use and value of external statements. 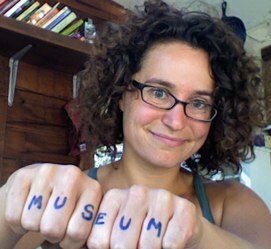 Have you done this at your museum, either directly with a document or indirectly through conversation? How do you help your community understand your goals and related methods? What happens when a formal art museum invites a group of collaborative, participatory artists to be in residence for a year? Will the artists ruin the museum with their plant vacations and coatroom concerts? Will the bureaucracy of the institution drown the artists in red tape? How will the visitors, the registrars, and the security guards respond? No, this is not a reality TV show. But for museum and art wonks, it could be. The Machine Project and the Hammer Museum have just released an incredible ebook documenting Machine's year-long residency at the Hammer in 2010. The 182-page book includes detailed descriptions of projects, budgets, and decision-making processes, along with extensive interviews with artists, curators, and museum staff of all stripes. The book is fascinating on multiple levels. Artists and administrators grapple with the shifting roles of institutions as hosts and incubators for creative work. Several artists offer surprising insights into making participatory projects appealing to visitors. The honest reflections from staff members beyond curatorial and education departments--including registrars, security staff, and PR--are unparalleled. And the projects themselves are brilliant. Here are a few elements that really resonated for me. When people at an institution speak of a problem, it is often to indicate something that interferes with their operation. From the artist’s perspective, a problem is a provocation or a site to which the artwork responds by creating something that engages the problem and makes it visible in a different light. The problem is aestheticized, framed, or reconfigured; it is seldom erased or resolved. Are you asking your collaborators to solve your problems or to help tease them out in new ways? Is it appropriate to ask artists to be problem solvers in the same role as designers or consultants? Much of the tension and creative spark in this book comes from the fundamental differences in perspective on this issue. This is particularly true when it comes to project evaluation. I'm a bit troubled by the lack of rigor in the evaluation of the impact of all these projects--big and small. Both Mark and Alison Agsten, the Hammer public engagement curator, talk lovingly about the power of the intimate, but it's hard to figure out how to act on statements like "We’ve talked often about how you measure success: it’s not just the number of people that come through; quality is part of it" (Alison, page 37). Mark often talks about how he and his collaborators do this work because it is their artistic practice, not because they are trying to achieve specific outcomes. I'm sympathetic to this perspective, but as someone who wants to be able to make a case for certain kinds of projects--and to make programmatic decisions based on research--I'd like to see the artists paired with some inventive evaluators. As artists expose and play with possibilities in engagement, it would be useful to see how those possibilities play out in terms of visitor responsiveness--whether the artists care about those outcomes or not. Otherwise, the artists' work gets put in the black box of "inspired activity" which may or may not be sustained or replicated by staff. Whose Job is it to Inform (or Confuse) the Visitors? I loved the sections of the book that focused on the interplay between artists and security staff. Security staff are so rarely involved in the creative development of public engagement projects, but in many museums--especially art museums--they are the staff members who end up negotiating them. Chris: Conflicts arose partially because we were also aiming to be the front line, so we were competing with them in a way. The initial response, from both management within security and more of the rank and file, was primarily resistance, confusion, annoyance, and generally not supporting it. I think, as with all unusual activities that interfere with one’s routine, that was a reasonable response. Once those activities become the routine, and with the right personalities involved, things start to smooth out. Chris [Kallmyer], I think, was exceptional in his approachability, and in his willingness to explain and engage, so he made it easier for the guards to eventually accept, respond, and enjoy. Many of the Machine Project's projects at the Hammer were designed for very small audiences. Eight person needlepoint and psychotherapy groups. Two person audiences in the Little William Theater. Frequently, we get stuck on developing participatory projects or events that serve as many people as possible. Machine had the vision--and the luxury--of creating big experiences for small numbers of participants. But, as Mark argued in conversation with poet Josh Beckman, these intimate experiences can "colonize the audience's imagination" (page 63) and have much broader impact conceptually. As an example, guitarist Eric Klerks provided a "personal museum soundtrack" to visitors by following people around with an electric guitar, playing music just for a single listener/visitor wearing headphones. The piece was evocative not just for the individual participants but for everyone walking through the museum alongside the participants--and probably, for most of you, who are just imagining what this would feel like. Eric: At first it was a little bit intimidating—all these looks that you get from patrons, especially the regulars. You can tell they are wondering why you are here but they don’t necessarily want to articulate it, so you just get this weird vibe. You know, I’m standing there and I’ve got my sign-in sheet, but it looks a little bit trivial. Mark: Right, like you apparently have permission to be there, but you are not quite part of the Museum. Eric: Exactly. But I think there’s a difference between something being difficult and something being a problem. The difficulty is almost as much a part of the event as walking through the gallery. If it had been a more clinical situation, where people came up to a desk and I was sitting there saying, “Oh, yes, we have this slot open and this slot open,” I think some of that intimacy would have been lost. It would have been more like those audio tours, and it’s not about that. Mark: Right. This piece is a critique of those pieces: those pieces are a sad simulacrum of a human interaction in the museum; this piece is about real engagement. This section really expanded my thinking, especially as I am trying to encourage my staff and interns not to always design for "maximal participation" but to also think about opportunities for intimate, surprising, and personal moments. It can get so easy to slide into "let's make a festival" mode and miss the opportunities for secrets in the elevator. Again, I'd love to see some evaluative study of this intimacy--perhaps to pair the artists with social scientists who measure cultural impact or evolution in perception of an institution over time based on small and distributed changes. There are many people studying the audience for participatory work--especially online--and it would be fascinating to understand more about the ripple effects of these projects on the broader visitor base. There are some fascinating bits about intellectual and artistic property sprinkled throughout the book. One of the reasons I feel strongly that museum staff should assume their own creative agency to create experimental public engagement projects is because then the museum owns the work and it can grow, perpetuate, and shift over time. That's not always true when you work with artists (or consultants). I always worry that the mindshare--and the related products--will walk out the door when the contract ends. Elizabeth: Some of what the grant was asking you to do was to develop projects that, in the end, the Museum could have used, or to generate ideas that we could have implemented in some way again in the future. So I feel like the Museum should have inherited the Ping-Pong tables as part of your Residency, with a plaque describing the work we did together during the Residency. ... [T]he sticking point in everyone’s mind is that what you proposed was not an artwork. The tables were situated in an unusual space in the Museum—Lindbrook terrace—that you hoped to transform over the course of your Residency into a social space. Mark: To me that shows a really strange idea of what art is—that art is completely determined by its instantiating moment. If I were a painter and you came to my studio and saw me working on a canvas, that material is transformed into an artwork at the moment I say it is an artwork. Similarly, we can think of the Ping-Pong tables as a social canvas that was transformed into an artwork by people using it. [B]ecause we’re a museum and we work with artists all the time, the words artist and ownership mean certain things to us, and we often distinguish how we, as an institution, contract with artists as opposed to consultants. In the past, we have drawn those categories very broadly and in relatively black-and-white terms, and one of the things we learned from last year is that sometimes it’s not so clear. Because a lot of the art was conceptual or ephemeral or something that we expected to incorporate into ongoing practice, we found that the implications of calling something “art” didn’t always reflect our expectations for the specific project or for who owned the work. Ultimately, I think this book does an extraordinary job of transparently, honestly, and provocatively presenting the impact of artist collaborations with institutions. Read it. Check out the related videos. Grapple with the things that inspire and frustrate and confuse you. I know I did. Mark has agreed to do one more interview (daunting after you see the list in the book) with us--with you--if you have specific questions you want to discuss. Please leave your thoughts or questions in the comments and Mark will join me in responding. If the questions are sufficiently voluminous, we'll do an interview follow-up post sometime in the next month. We've gotten a little more organized at The Museum of Art & History, and we've now released opportunities for summer internships. These are unpaid part-time and full-time opportunities to help design public programs, develop new uses for the museum, perform visitor research, and pursue unusual projects. Community Research interns, who will start developing a methodology for us to use to understand how people in Santa Cruz connect with arts and culture experiences and what role the museum can play in satisfying their interests. This could be a serious research opportunity for someone interested in impact assessment, community attitudes towards the arts, and the role museums can play in transforming communities. Special Projects interns, who will do, well, whatever you want. This internship is for the truly self-motivated person out there with a brilliant idea for making museums more participatory, welcoming, community spaces who just lacks an institution at which to try it out. Our internships have generally gotten more structured. This is the Pigpen in the family--the internship for the wild-eyed but highly effective person who wants to make something amazing happen. But I would be remiss if I did not say that the community programs internships are all rocking. Stacey Garcia, our Director of Community Programs (who began as a graduate student intern) is the queen of working with interns to produce truly inspired events. Community programs interns work with artists and historians, families and adults, to make everything from mini-participatory exhibitions to full-blown concert series. While we offer very few exhibitions-focused internships at the MAH, community programs interns often have the opportunity to do the kind of research, design work, and prototyping that exhibitions folks do--and their work ends up on the floor far more frequently. At the MAH, interns are most successful when they are highly motivated people who like to work collaboratively and can deal with a little chaos. Based largely on your feedback, we've gotten more explicit about intern supervisors, expectations, and roles. But we're still a group that thrives on spontaneous craft material trips to the dump and sudden breaks to help wheel a piano in the door. Sounds good? Good. Come join us. Last week, I did something I hadn't done in ten years. I walked into a boxing gym. In college, I'd boxed a bit recreationally, and it seemed like a good time to pick it up again. In the fall I bought a Groupon to a local gym. Four months later, here I was, ready to take my first class. The gym was full of young men working out, pushing themselves, and generally having a great time. The vibe was friendly and aggressive. I'd called the day before and knew what to expect. Despite this preparation--and the years I'd spent in similar gyms as a college student--it took almost all my willpower not to turn around and walk out the door immediately after entering. I'm glad I didn't; the class was excellent. But I was struck by the incredible stress that comes when you jump into an unfamiliar situation or subculture. There was nothing threatening about the people at the boxing gym. And yet I felt threatened, uncertain of whether I was up to the challenge, ready to be the newbie, willing to be a novice woman among men. We often talk in cultural institutions about reaching out to new audiences and helping them break through the threshold fear that may accompany first-time museum or cultural experiences. And yet for many cultural professionals, "threshold fear" is a hazy term. How could a person possibly feel intimidated, truly frightened, of entering a museum? How scary or confusing could it be? We can't fathom that kind of fear, and so we demean or disregard it. If you're a museum person and you want to understand threshold fear, don't go to a museum. Go to a boxing gym. Go to an uberhip bar. Go to a place of worship that is not your own. Go to a tattoo parlor. Find a place where you feel an incredible urge to bolt out the door the minute you walk in. Go there alone. See what makes sense and doesn't to you. Consider what intimidates you and what you feel comfortable with. Note the people, areas, or experiences you gravitate to as safe starting points. And then go back to your own institution and try to see it through that lens. Hold on to your pounding heart, and imagine carrying that adrenaline through your own front door. This is incredibly difficult. I can't do it with my imagination alone. But what I can do is put myself in those uncomfortable situations and perceive the raw power of the stress that accompanies them. What I can do is find people who feel that way about my institution and travel the halls with them as my guide. Threshold fear is very real. If we're going to overcome it, we've got to respect it. In this age of self expression and information overload, do our artists and arts organizations need to lead more or learn to follow their communities more? Sixteen arts administrators, journalists, and researchers weighed in on the question over a series of posts. Several decried the oversimplification of the question, arguing that it's not an issue of "lead vs. follow" but a spectrum of forms of participant engagement. A few trotted out familiar arguments for arts administrators as tastemakers (lead) or audience research as incontrovertible (follow). And some made fairly brilliant and impassioned cases for idiosyncratic perspectives. Here are three of my favorites... and a few more thoughts. Bedoya, the Executive Director of the Tucson Pima Arts Council, makes a beautiful statement that arts administrators need to facilitate a multiplicity of leading voices, or as he puts it, "the courage of imagination and the plural." Particularly in an age of cultural and political division, Bedoya argues that leaders in the arts need to responsibly and boldly intermediate among many voices, using a combination of ethics and aesthetics to make policy and artistic decisions. If you care about how participatory art experiences can shape civic processes, read Bedoya's post. Ragsdale, researcher and author of the terrific Jumper blog, suggests that most arts organizations are not "leading" communities but disregarding and demeaning them. Audience engagement happens strictly on institutional terms, for institutional purposes, and when audience members' views differ from the organization, their perspectives are not taken seriously. Ragsdale equates true following with listening, and acting on listening with leading. It's a good post that is representative of her powerful writing (mostly focused on the performing arts). O'Donnell was not one of the invited bloggers but a commenter from the field (a follower... or a good example of how silly the term "follower" is?). He made a comment on Michael Kaiser's fairly formulaic "great artists lead the nation" post, laying bare the banality of most of the language used to describe and present art experiences to the public. O'Donnell notes that great leaders don't sell their message with generic templates and exclamation points, but with "relevant, meaningful, motivational language that leverages the needs, wants and desires of their listeners." The way we talk about our work helps shape its importance to current and potential audiences. This whole debate made me think about Adam Lerner, the Director and Chief Animator of the MCA Denver. Adam and I first met in 2008, when we were part of a National Academies think tank-ish thing on the future of museums and libraries. All the participants were asked to write one-page position papers about museums and libraries in the 21st century. Adam and I wrote papers that split dramatically on either side the lead/follow line. Adam argued for museums to become "less visitor-oriented," and I argued the opposite. He said museums were too spineless to project their own voices and so were misguidedly searching for direction from audiences. I said museums were too self-centered and needed to create community spaces with the growing army of people choosing cultural experiences outside of traditional arts institutions. The paradox is that developing a clear, authentic voice doesn’t isolate the institution but infinitely expands its relevance in the life of the city and citizen. It is so clear what the organic supermarket Whole Foods stands for, so they don’t need to worry about just selling food. They sell clothing, books, classes, skin care, yoga supplies, which all relate to the core of who they are. Museums have had difficulty becoming more integral to people’s life because they lost sight of their core, which should be different for each museum. A museum concerned with integrating art into the life of young people might find it appropriate to open a dance club. A museum that believes that it is most suited to be a temple of art can be a truly meditative oasis in the heart of a bustling city. A museum that is committed to childhood education might find it relevant to open a charter school. Museums in suburban locations need to determine how they can integrate themselves into the leisure patterns of their own constituency. Museums shouldn’t change by looking elsewhere; they should change by looking more carefully at themselves. That’s too difficult a task to pass off to visitors. I'd add the caveat that for some institutions, it's too difficult a task to pass off to visitors. In an institution like mine, where the organizational identity is built on participation, the task can and must include them. In the end, the issue is not who is leading or following, but the fact that we're dancing with our audiences in the same room, together. Not in separate rooms to separate songs. What did you get out of the Lead or Follow experience? How do you respond to this question?